CHI has had persistent operational and financial losses since 2012. According to CHI’s Fiscal Year 2016 financial report, the company suffered a $460 million operating loss. According to Moody’s, CHI's total debt is at $9.0 billion and their outlook remains negative. The continued weak balance sheet will lead to further downgrades of long term and short-term bond ratings in the future. As a result, they are seeking a merger with Dignity Health yet another conglomerate organization. This past week, the nation watched as Hurricane Harvey became the costliest natural disaster in U.S. history. Some have called it a “1,000 year storm.” Tens of thousands were evacuated from their homes and needed shelter. The death toll is slowly climbing. Parts of Houston may be uninhabitable for weeks to months as the city works diligently to recover from the damage, physical, psychological, and emotional. In June 2016, Kitsap County emergency personnel participated in Cascadia Rising, a large-scale earthquake drill. At the time, three local hospitals planned to coordinate management of injured casualties: Navy Hospital, which would treat the “walking wounded” (least injured), or Harrison Silverdale and Harrison Bremerton, which would clear their emergency departments to receive the flood of injured patients. While those plans have changed, the grave risk to our community in the event of an earthquake should not be ignored. In a Mass Casualty drill more than twenty years ago at Madigan Army Medical Center, I learned that optimum survival unequivocally depends upon sifting the distribution of injured casualties through the filter of expert triage. Working fifteen years as a regional pediatric CPR instructor for the American Heart Association has taught me the value of ensuring emergency skills keep up with scientific progress. Likewise, Kitsap County emergency plans will need modifications to reflect our changing healthcare landscape. The World Health Organization defines a Mass Casualty Incident (MCI) as “an event which generates more patients at one time than available resources can manage using routine procedures.” Successful medical management depends upon the rational utilization of resources to ensure the timeliest treatment for the greatest number. It is well accepted that smaller hospitals (those with Level 3 or 4 designations) face challenges treating larger numbers of casualties due to resource limitations. The ‘golden hour’ is the 60-minute period when medical intervention is most effective at reducing mortality following trauma. Remoteness can preclude timely access to a Level 1 Trauma Center, like Harborview, which is 65 miles away. Quick evacuation and transfer to an appropriate receiving hospital can be a highly critical task. Casualty distribution decisions must prevent overwhelming a single facility, as exceeding hospital capacity can jeopardize care quality. If only one hospital emergency department remains, there will be no alternative. The Seattle Fault runs through Kitsap County from the Hood Canal to the Puget Sound. FEMA predicts an earthquake of 7.0 or greater magnitude could injure 400 people severely enough to require hospitalization and kill more than 150 people; thousands more could sustain minor to life-threatening injuries. Survival outcomes will depend upon this ‘golden hour’ response time. The best scientific studies were conducted in Israel following accidents or terrorist attacks. They demonstrated that utilizing two lower level ER/hospital facilities in tandem was critical to efficient management of injured casualties, particularly occurring outside a metropolitan locale. For Kitsap County specifically, the best case report in the literature involves a passenger train and truck collision in a geographically isolated Israeli town. Air evacuation by helicopter enabled rapid transport of casualties from the accident scene to two lower-level trauma centers and permitted equitable distribution of the wounded. According to the study, 289 passengers were injured and 7 were killed. Six helicopters participated, evacuating 35 victims by air, with an elapsed time between first helicopter landings to mission completion of 83 minutes. Due to the fact access could be complicated by geography, air-medical evacuation has been strategically incorporated into the county MCI response plan. 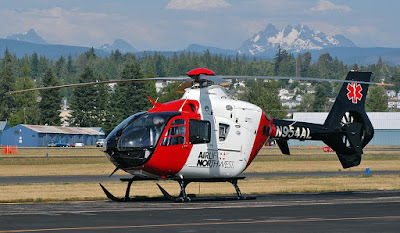 Understanding our topographical limitations, I spent six weeks on Life Flight Teams 1 and 3 in Colorado conducting helicopter and fixed wing patient transports in preparation for independent medical practice on the Olympic Peninsula. One helipad at one hospital plus one accessory landing zone will not allow adequate means by which to transport the high volume of casualties conceivably produced by a MCI. The Israeli case report specifically highlights the value of using unconventional solutions when navigating geographic challenges. In the event of a devastating earthquake, our community could be isolated for days or even weeks, as connection to mainland, by bridge or ferry, may be temporarily disrupted. The Peninsula has 3 level III centers, Harrison Bremerton and Silverdale (336 beds), and Olympic Medical Center (126 beds.) Jefferson Healthcare and Mason General have Level IV designations. Due to the fact that access to high level trauma care requires crossing a bridge, evacuation by helicopter will be essential. “Cold” loading (the method used by non-military medical teams) is safest; yet requires landing, shutting the engine down, loading the patient, and then lifting off, with a turnaround time of 13-15 minutes at a minimum. A single facility will quickly become massively overwhelmed; whereas, having two to four landing zones at two hospitals provides the opportunity to meet the needs of wounded casualties most efficiently. The pattern of distributing casualties to multiple receiving centers after MCI’s in the United States is well-established. Victims of the Columbine massacre were evacuated to six different hospitals. After the devastating Virginia Tech shooting, 29 victims were triaged through four facilities. One hospital assisting that effort was Montgomery Regional, with a Level 3 designation; they had the capability of receiving only 15 wounded, yet successfully stabilized them all. Three who were more severely injured were directly transported to the nearest Level 1 Trauma center 27 miles away. Outcomes absolutely depend upon matching casualties with facilities having the adequate resources to stabilize them. In Aurora, CO, 100 injured people from the movie theatre were sent to six different hospitals. Not only did first responders coordinate flawlessly, but they also used unconventional distribution procedures which improved outcomes. For the first time, victims were transported two to three at a time inside of police cars. A retrospective analysis concluded this single decision saved the lives of many, even though emergency personnel took a chance. CHI consolidation plans involve a calculated risk too, one which may cost more lives than initially anticipated in the long-run. A two-hospital solution provides our best chances for survival in the event of a MCI, an assertion backed by solid scientific evidence. The procurement of every hospital bed by a corporation on the brink of financial implosion and their ill-fated hospital consolidation is gambling with our lives. Since Cascadia Rising, the ER at Naval Hospital has downgraded to an urgent care, leaving fewer options for allocating casualties. Moreover, Kitsap County is poorly situated geographically, precluding timely access to high level trauma care, which makes thoughtful triage, evacuation, and transport of victims even more critical. In my opinion as a mother, community physician, and county resident, a two-hospital solution is best for the entire population of Kitsap County. This hospital consolidation controversy has mostly focused upon CHI financial quandaries, the fact monopolistic systems drive up cost, and guaranteeing freedom from their religious directives. Additionally, we must prioritize preserving and protecting the 250,000 innocent lives of those residing in our beloved community in the event of a mass casualty incident.